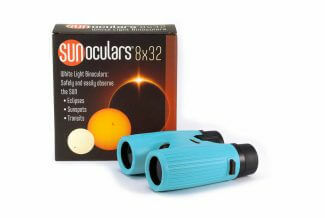 These full-aperture optical glass telescope filters deliver superb views of the Sun, without risk to your eyes. While more expensive than black polymer film filters, Orion glass solar filters provide better contrast, a more natural yellow-orange color instead of blue, and their glass and aluminum construction is much more durable. They’re ideal for photographing the Sun too! Please note this product was not designed or intended by the manufacturer for use by a child 12 years of age or younger.